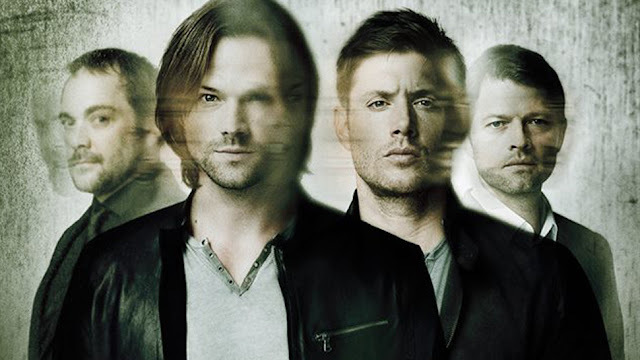 Sam and Dean are in maximum hunting mode, moving from case to case to case while Dean gets crustier and crustier. Dean, you’re hot, but no-one’s hot enough to put up with that level of hygiene. What is the source of all of these new missions? Sam is getting data from the Men of Letters. And like Mary, he’s lying to Dean about it. Dean, you need to have words with your family. This week we have a hellhound running amok killing one guy and chasing his girlfriend who was just saved from having to have an awkward conversation about how she’s not that into him when he has an engagement ring all ready. -and can we have a moment to look at Dean’s epic lack of fucks to give. I think this, along with last episode him being hailed as a killer, is showing more and more how burnt out Dean is. Dean is spending less time and energy on victims and his snarky commentary through this – his eagerness to get on with this and fighting is clear. Gwen’s feelings and fears? Less important. And they call Crowley – who is still kind of annoyed with them – to let him know one of his hellhounds has gone rogue. Looks like Crowley has been letting things slip in Hell again (honestly the king of hell gig is awful for Crowley because he’s utterly uninterested in actually doing the job). And one of his Hellhounds, the hellhound, the first hellhound, has escaped and is now after Gwen because she managed to fend said hound off with an axe. They also have an almost 4th wall breaking moment commenting on Dean’s Manpain (literal quote from Crowley) and the Innocent of the Week. Looks like at least someone on the Supernatural writing squad is very aware of what they’ve created. Instead the hound chases down Sam and Gwen and is duly murdered with both of them. Gwen has been excellently willing to step up in her own defence throughout this episode. Sam does thank Crowley though. He sounds like he’s choking on it. So how did this hound escape? And it looked like it was going to when demons actually free the hellhound to create a distraction to allow them to free Lucifer after a) making a deal (and being promptly betrayed because LUCIFER, seriously you trust this guy?) and b) being such a fanboy he actually made Lucifer uncomfortable).